Pen, Cat and Will met on the first day of college and soon became an inseparable trio. Best friends through thick and thin through college. After parting ways in the aftermath of a major fight, Pen and Will each receive an uncharacteristically bland e-mail from Cat asking them to come to the college reunion. When Pen and Will arrive, they find out that there is more to Cat’s e-mail than they thought. Sent by Cat’s husband in hopes of finding out where Cat is, the three unlikely partners set off to find their best friend/wife all while working through the issues of the demise of their friendship. The book is told mostly through flashbacks with Pen as the dominant focal point. Although I like the use of flashbacks to fill in gaps, I felt that this book was filled to the brim with them. The reasons that the three friends broke-up felt weak, nothing that should have sustained 6 years of silence between the three. I also felt that Pen was very emotionally unstable, but in a way easy to relate to. Having to learn to deal with the grief of her father passing away expectantly, I could readily relate to her. Granted, she is no Cornelia Brown. Maris de los Santos did a good job of creating characters that could be easily approachable by any reader. From emotional Pen, to free-wheeling Cat, and frat boy Jason. I’m not sure what 1-word descriptor to use for Will…any suggestions? I read the book in one day, I wanted to know what was going to happen next. What was the next clue to finding Cat, would they find her, and where would they find her? The romance set up in the beginning of the novel between two of the characters was pretty predictable, but in no way less enjoyable to see unfold. I did find that the progression of Pen and Will’s relationship to heavily mirror that of Cornelia Brown and Teo Sandoval from Love Walked In. I found the ending of the book to be somewhat disappointing though. Mostly in regards to Cat’s character. So much of what we know about her is told through flashbacks, and nostalgic reminiscences for about 90% of the novel. Cat is made to seem larger than life (despite her physically small size). This fell flat for me towards the end of the novel. It felt as if the characters were too reliant on their own views of Cat to really see her for what she is. There are elements in this book that make it a good read, but there are also elements of the book that make it frustrating and disappointing. 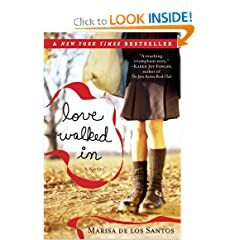 Fans of Marisa de los Santos’ previous works, Love Walked In & Belong to Me, will appreciate her unique and wonderful writing style. The plot of the story was what bugged me the most, even though I kept reading to see what would happen next. The story felt unbelievable, although the characters felt real, if that makes any sense. 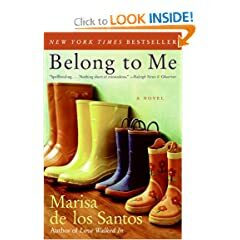 Belong To Me, by Marisa de los Santos is a sequel (of sorts) to her highly acclaimed and reviewed Love Walked In. I finished the latter book only a few weeks ago before I heard about Belong To Me. I quickly placed a hold on the title from my library and two weeks later, I sit here, having finished the last page, completely unsure of how I feel about this book. Belong To Me picks up where Love Walked In left off. Cornelia and Teo are now married, and move to a quiet suburb where not everyone is quite what they appear to be. There is a healthy cast of characters in this novel, with Piper Truitt (nosy neighbor extraordinaire) and the Tremain family Lake and her some Devoroux. Just as she had done with Love Walked In, she took seemingly detached stories and wove them together through tragedy, compassion and some sort of epiphany and realization. The book is very well written, I love Marisa’s ease and fluidity of her prose. Her descriptions are detailed, but not overbearing. Her characters are colorful and have their own background stories and don’t just play 2-D figures in the books. This book is a story of families, and how they form in different shapes and sizes. In Love Walked In, we were introduced to Cornelia Brown, a Cafe manager in Philadelphia and Clare Hobbes; daughter to a distant father and bipolar mother. In Love Walked In, de los Santos alternated the perspective between first person for Cornelia and third person for Clare. In Belong To Me, we still have first person for Clare, but now we have two additional third person perspectives of Piper Truitt and Devoroux Tremain (extremely smart and gifted 13 year old). I’m half wondering if her next book will have four character perspectives, and so forth. At times it was distracting, at times it was frustrating. Although I felt very attached to Cornelia, I have no feelings for her family whatsoever, so the plotline of Cornelia’s brother Toby and his girlfriend seemed forced. I do see Marisa’s point of Toby’s story; that there are multiple ways to be a family, and raise happy children. That love is not the end-all cure for every bump in the road, or always the answer to every question regarding parental responsibility. My other frustration with the book, and although I do adore de los Santos’ writing, I felt that this book dragged on. Towards the last fourth of the book I found myself skimming because I had at some point stopped caring about the characters. I just wanted them all to come to terms with the truth and stop stalling. I think the book would have worked better without the Piper addition, but then the story would have been eerily similar to Love Walked In. TEASER TUESDAYS, hosted by mizb17, asks you to: * Grab your current read. Let the book fall open to a random page. Share with us two (2) “teaser” sentences from that page, somewhere between lines 7 and 12. You also need to share the title of the book that you’re getting your “teaser” from … that way people can have some great book recommendations if they like the teaser you’ve given! Please avoid spoilers! She stood at her front window, looking out, distracting herself, trying to place some distance between herself and whatever Elizabeth was about to say.Cornelia and Teo were in their front yard raking leaves, Tea with long, easy strokes, Cornelia with intensity and precision. Short people always try too hard, thought Piper. This is a book I’ve seen floating around various blogs all last year, so when it showed up in the donation bin at my library, I couldn’t help myself. I picked it up, along with 5 other books. I started this book, and instantly I could not put it down. The story is fresh and lively, the characters are wonderfully conceived and portrayed. The book follows the lives of two people. There is Cornelia, a cafe manager living in Philadelphia. Her story is told through the first person, and we learn immediately about her love for all things classic, particularly classic movies such as The Philadelphia Story. Reading Cornelia’s sections of the book only had me adding movies to my already long queue on Blockbuster. Cornelia’s appreciation of the classics makes her a romantic at heart, and is what instantly leads to the love at first sight meeting with a dashing gentleman that walks into her cafe. The second person is Clare, an 11 year old girl of divorced parents, witnessing her mother slowly lose her mind and grip on responsibility and herself. The Clare sections are told through the third person. While I’m not sure why Marisa De Los Santos chose to go with two different perspectives for each character, I think it worked well with the overall flow of the story. While Cornelia and Clare are living their lives, Cornelia in love, and Clare in a seemly organized state of chaos, their lives do intersect and are then interwoven in this touching story about finding love and comfort in the most unusual of places. This story reminded me a lot of the movie No Reservations with Catherine Zeta Jones. Many of the same themes (in fact some very similar scenes) from the movie are in the book. There is the unlikely mother figure in a non-mother caring for a child who has just lost her mother. The new mother figure finding love in something other than what she has been putting all of her energy and time into nurturing. There were many parts of the novel that felt too Hallmark for me, and I think lacked a bit of realism. Clare seemed to intuitive and insightful for her age. Overall, I love the relationship that Cornelia and Clare formed, with the help of Cornelia’s brother-in-law Teo. I do with that De Los Santos spent more time on Linny, Cornelia’s best friend. She is incredibly insightful, and straight-forward type of friend with no hestitations about life. I was sad that she disappeared for the majority of the book and only slightly reappeared later on. The focus of the story is Cornelia and Clare, but De Los Santos did not skimp on the personalities of the supporting characters. Despite the Hallmark moments and neatly-wrapped up ending, De Los Santos has a magnificent writing style that is unique.